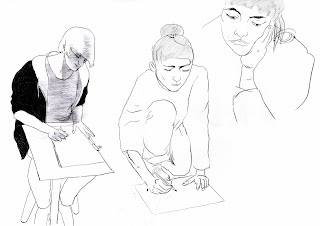 Comics of Sofie Louise Dam: Drawing croquis! Last week we did lifedrawing with Artem Alexeev, which was amazing. We did exercises in croquis, we went sketching in town and did some composition/illustration exercises and drawing each other. Here are some sketches from the past two weeks.